Designed for professional video projects,the ImageDP4+ graphics card is a highly scalable graphics card for use with multiple screen or projector installations. The ImageDP4+ cards operate under Windows®10, driving the very latest in graphical performance. Multiple cards and outputs work together to spread the Windows desktop across a multi-screen surface. The Datapath drivers can allow for monitors positioned in either landscape or portrait or a mixture of the two. The ImageDP4+ is optimised for use with the Datapath Vision range of capture cards and IP decoding cards for systems requiring SD, HD, 4K and IP video capture and display. Video windows can be positioned and sized anywhere on the multi-screen desktop, while maintaining full frame rate and true colour rendering throughout. 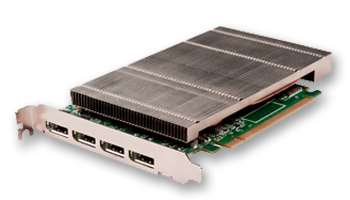 When used with Datapath Vision capture cards HDCP content can be delivered to the screens. Each of the 4 DisplayPort outputs can support up to 2560 x 1600 @ 60fps, or use 2 outputs to support 4096x2160p resolutions at 30fps. The ImageDP4+ includes 2GB of memory to allow that will drive the most demanding of applications. We have a highly optimised driver to run efficiently with Datapath hardware available for use with Windows 10 64bit. The function of the display driver is to present one large desktop to the Windows operating system. The multi-screen driver will support up to 32 screens. If utilising Windows 7, there is the ability to support up to 64 screens. Datapath Wall Control software enables you to simply launch and position video and application windows to create complex wall layout configurations. Wall Control presents a representational window of the entire display wall showing position and size of windows, including a live sample of all video content. With the full version it is possible to save layouts and recall them for future use and also operate Wall Control on a remote PC via a network connection. The ImageDP4+ card is supplied with a free version of Wall Control without these advanced features.